ORLANDO, FL--(Marketwired - October 08, 2013) - Southwest Airlines Vacations is offering travelers 20 percent off Disneyland® Theme Park Tickets when booking a Southwest Vacations package. Guests will create lasting memories with their families as they live a storybook vacation with exciting theme park ticket savings. 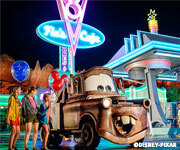 Add to the magic of your vacation by staying at one of the fabulous Disneyland® Resort Hotels. Travelers who book a flight, hotel, and theme park ticket vacation package with Southwest Vacations will save 20 percent on their theme park tickets when using the promotion code DLRTXT20 at the time of booking. To take advantage of this Disneyland® Resort vacation deal, travelers must book their packages between October 1, 2013 and October 21, 2013 by 6:00 p.m. Central Time for travel October 2, 2013 through February 28, 2014. One-day advance purchase is required. Restrictions may apply. Customized vacation packages include roundtrip flight via Southwest Airlines® and hotel accommodations (including taxes). Plus, first and second checked Bags Fly Free® -- savings of up to $120 per person, roundtrip. † Even Golf Bags Fly Free®. Visit the Benefits of Booking a Southwest Vacation page to learn more about everything included in a customized vacation package. About Southwest Airlines Vacations - Southwest Airlines Vacations offers vacation packages to over 95 destinations with flight service available from every scheduled Southwest Airlines departure city. Additionally, we offer vacation packages to Mexico & The Caribbean from most Southwest and AirTran departure cities, with flight service operated by AirTran® Airways. Travelers can customize vacation packages to include flight, hotel, car rentals, show tickets, attraction passes, tours, and more. Southwest Airlines Vacations is located in Orlando and operated by The Mark Travel Corporation (TMTC). TMTC is a member of the USTOA $1 Million Traveler's Assistance Program and ASTA TOP. For more information on Southwest Airlines Vacations, please visit: http://www.southwestvacations.com. *$220 ticket savings is based on purchase of four-day Park Hopper® tickets for two adults and two children. 20 percent off theme park ticket promotion code savings apply on flight plus hotel plus Disney Theme Park Ticket vacation packages. Savings is reflected in the package price when using promotion code DLRTXT20 at the time of booking. Length of stay for flight and hotel components must match. Promotion code intended for redemption by individual consumer only. Savings valid if booked October 1, 2013 through October 21, 2013 by 6:00 p.m. CT for travel October 2, 2013 through February 28, 2014.